Our social media solution lets your customers get in touch via the communication channels that suit them. Syntelate XA monitors your social media accounts and optionally also keywords that you want to track. You can even prioritize messages differently based on keywords. For example, you could automatically set any message containing the word “complaint” to the highest priority. We support Facebook and Twitter, and Syntelate XA’s architecture makes it easy for us to integrate with additional social media services too. If you’d like to support some other platform, please get in touch to let us know. When Syntelate XA picks up a matching message – whether publicly posted or sent as a private message to your company – this is passed to an agent in Syntelate XA. Syntelate XA matches on the customer’s username and, where you have the customer’s social media details on record, automatically retrieves the customer’s details. This means that, from the very start of the interaction, your agent has the customer’s record in front of them, including a full interaction history across all channels. With this information, your agents can always give your customers an informed reply. The agent types their response directly in Syntelate XA, and Syntelate XA then posts this using your company’s social media account. Syntelate XA’s social media monitoring lets you take ownership of how your company is seen in the public eye. Let’s say something has gone wrong, and a customer posts a complaint on social media. It’s unfortunate, but as much as we try to keep our customers happy all the time, it happens sometimes. 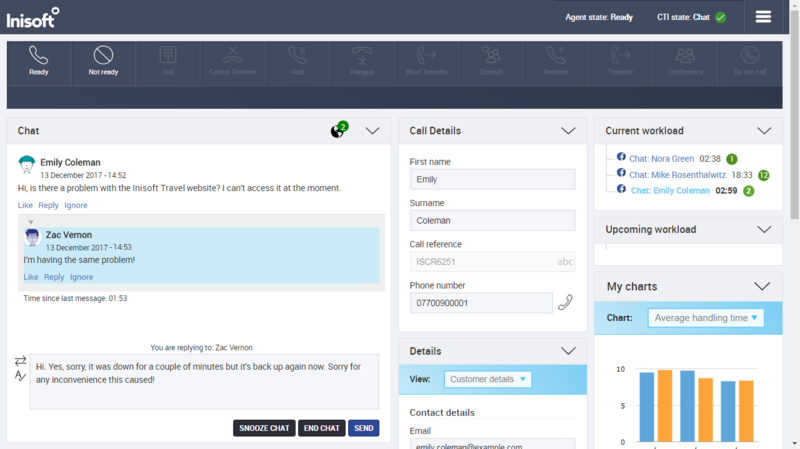 Well, by pushing this complaint to an agent straightaway, Syntelate XA lets you turn the situation around. The right reply, delivered quickly, can diffuse the situation and make the customer understand how much you value their business. This not only keeps the customer happy, it also reflects well on your company, both to other customers and to potential customers in the public social media space. Let agents deal with multiple chats at a time. These can even be a mix of web, SMS, and social media chats (if you also take the Web Chat and Email/SMS modules). Let agents transfer a social media chat to another agent – for example, if the customer has a second question that the first agent can’t help with. Automatically capture statistics for reporting, such as the total duration of the social media interaction.